I have a love-hate relationship with this photo. I took it a few nights ago when it was completely dark outside and I had ran out to let the dogs out. 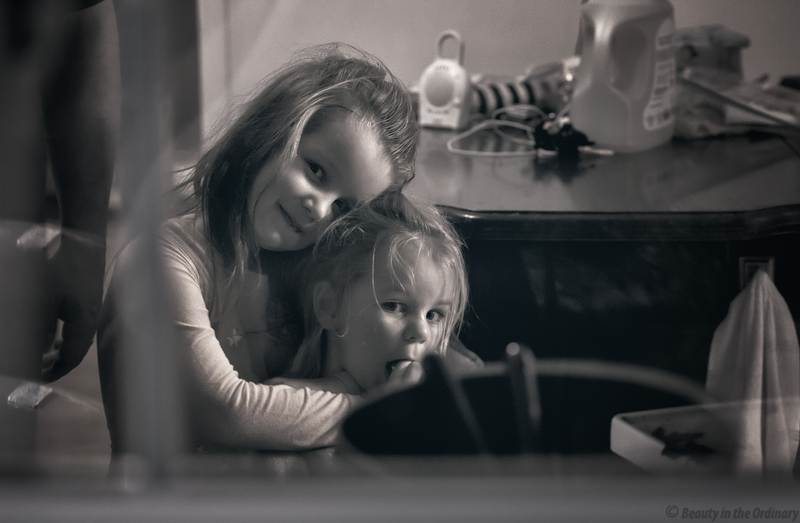 When I looked in through the kitchen window, I saw the girls hugging each other. I just happened to have my camera hanging around my neck and quickly snapped a few photos. The light in the kitchen was not very bright and I had to bump the ISO up really high to get correct exposure and my old Canon 5d does not handle high ISO too well. That’s part of why I don’t like the photo – there is just too much digital noise. The other part is our not-so-clean kitchen island that takes up most of the frame on the right. I love how my girls look in this shot though and I think it’s a pretty sweet moment to have captured.